It’s been too long since I’ve done a So Simple It’s Silly recipe. I have been cooking, but gotten sidetracked with other things like the wedding, bachelorette party and best of all, starting my very own food business! Enough ramblings from me, on to this incredibly easy weekday dinner. Sometimes when you’re tired and honestly just want something fool-proof and quick to put together, this is the meal for you! 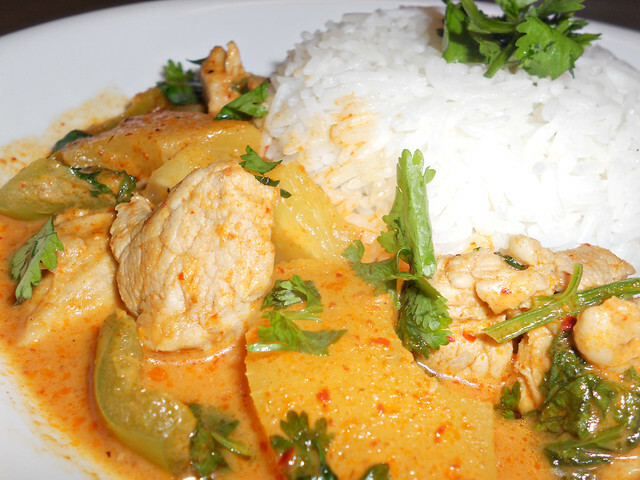 Rich spicy red curry with sweet pineapples, coconut milk, cilantro and your meat of choice. I just happened to have pork in my fridge. It’s one of my go-tos and always satisfies! 1 can Coconut Milk, unsweetened 14 oz. 2. Add your 3 tablespoons of Red Curry Paste and allow to coat the pork and peppers as well as fry in the oil. Continue to stir until curry becomes fragrant. About 3-4 minutes, do not let the curry burn! 3. Add your coconut milk, sugar, fish sauce, water, cayenne pepper and red pepper flakes(extra peppers are optional, you can control how spicy you want your curry!). Stir well to dissolve curry into liquids, allow to come to a boil before lowering the temperature to a medium low. Let simmer for 25 minutes uncovered. 4. If you’ve bought Pineapple chunks (don’t buy crushed pineapples for this recipe! ), you can add just as. If you bought pineapple rings, quarter each ring. 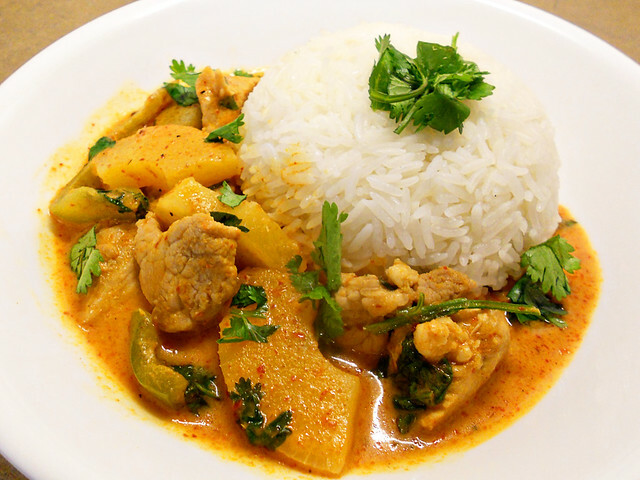 Add pineapples to your curry along with all the pineapple juice. Simmer an additional 10 mins to allow pineapples to heat through. 5. Check for seasonings, add salt and black pepper to taste. If your curry is on the thin side, you can add a cornstarch slurry (water + cornstarch), bring the curry to a full boil for 5 minutes to allow slurry to thicken the liquid. Finish with the juice of 1 lime and the chopped cilantro. 6. 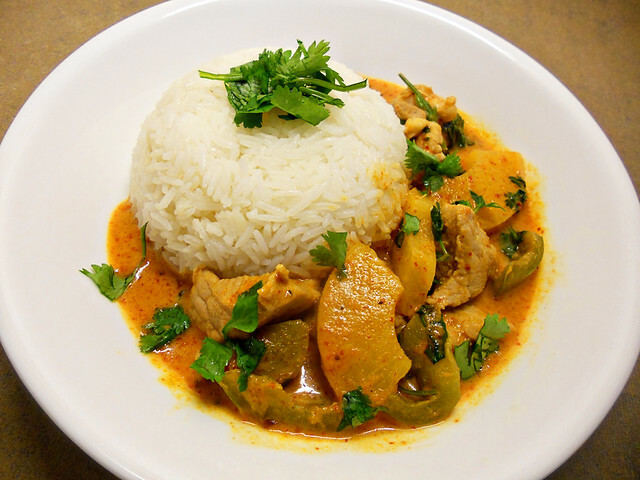 Serve with hot fragrant steamed Jasmine Rice. 1. You can use any protein of your choice. Chicken works well with this recipe. 2. I chose to use a store-bought Red Curry paste because it’s readily available in the Ethnic aisle of your local grocery store. 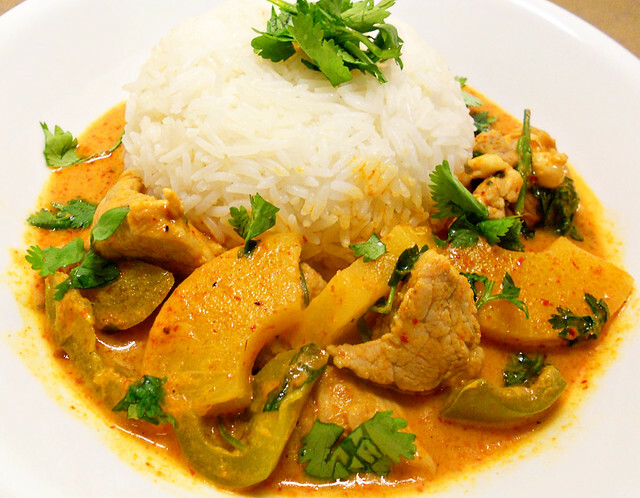 You can make your own Red Curry paste also. I will do one in a later blog post. 3. 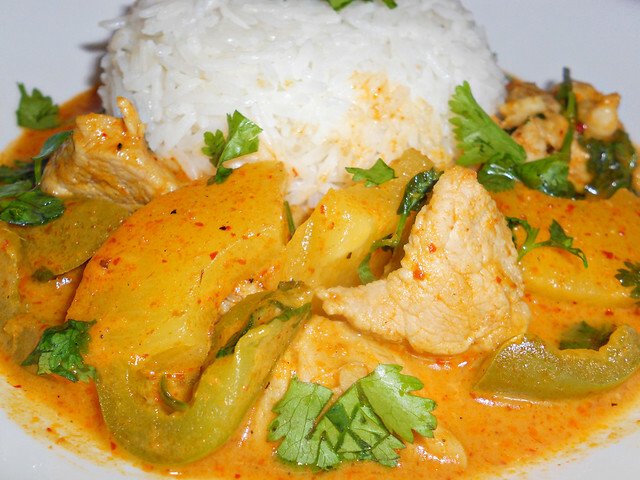 The pineapple juice adds a great sweetness and acidity to help balance the spice rich curry. 4. You can add other vegetables to this recipe. Bamboo shoots and tomatoes also work well. 5. It’s crazy easy and you can’t mess this up! Good luck and enjoy! Lol @ Papaya! Really and honestly, it is simple! I made a home made Khmer style Wonton noodle soup.. with homemade stock and pork wonton and I thought that was simple also! I need to post that recipe up a.s.a.p! how come i didn’t get any?? Cus you didn’t come over! Is it really supposed to be 4 CUPS of water? It should be 1 cup of water, thank you so much for asking or else I wouldn’t have even noticed! I’m going to edit it now.